A £50 deposit to secure your date and Damage deposit this will be refunded within 7days after the caravan has been inspected. Please bring your own towels and tea towels. Bedding is provided. ALL SCHOOL HOLIDAYS ARE 7 NIGHTS BOOKING MINIMUM. (bookings are Saturday to Saturday). FROM MAY 2019 3 OR 4 NIGHT BOOKINGS WILL BE CONSIDERED BY THE OWNER. ALL BEDDING IS INCLUDED, PLEASE STATE WHICH BEDS NEED MAKING UP ( so no need to bring any bedding). 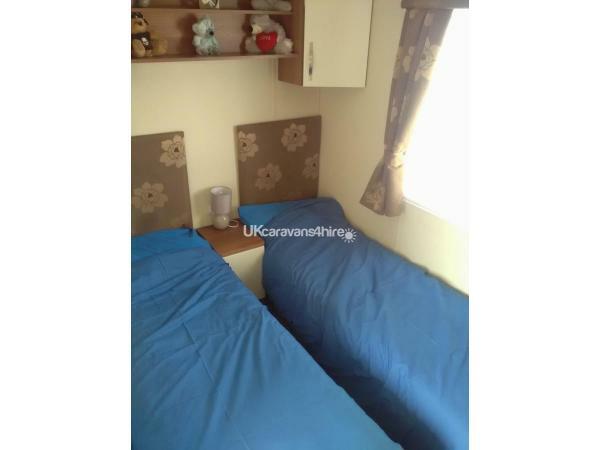 Our Superb caravan is fully central heated and double glazing throughout making it warm anytime of the year, it has a open Lounge with a pull out double bed under the main seat, also included a Free sat TV and Electric fire, the dinning area comfortable seats 6. The Kitchen is fully equipped with a intergrated fridge freezer, gas cooker, microwave, kettle, toaster, crockery, cutlery, saucepans, slow cooker, iron and ironing board, and so much more. The Master bedroom has a double bed, vanity area, and a en-suite toilet and fitted wardrobes. The second bedroom has two single beds, a wardrobe and fitted cupboards. 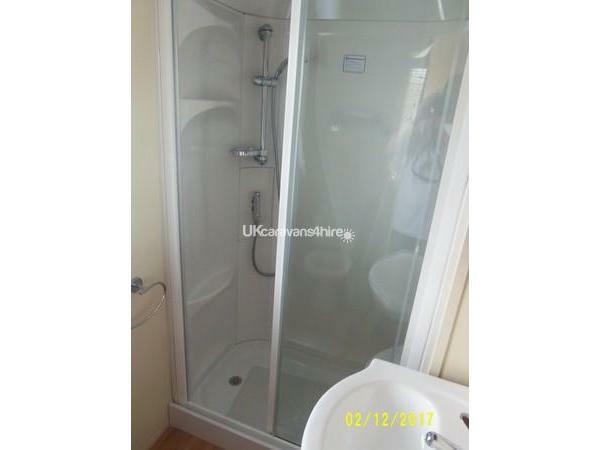 The bathroom has a walk in shower, toilet, sink with mirrored unit. Quilts and Pillows and Bed Linen are provided. ONLY SMALL DOGS ALLOWED AND BREED MUST BE STATED. We take booking from 7 to 14 nights and some 3/4 nights depending on time of year. Arrival time from 2pm and Departure time 10am( if different times required please ask when booking) thanks. Please note. NO TOWELS OR TEA TOWELS provided. 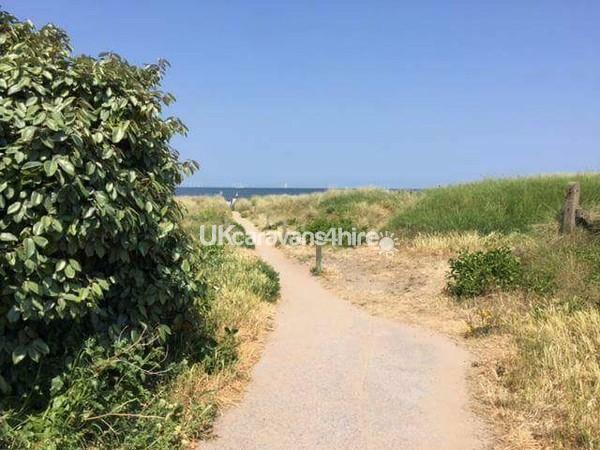 Lido Beach is a quiet site and a great starting point to explore North Wales, the site has a children's play park, tennis court and 5 a side football, a laundrette and onsite café, there is a lovely child friendly pub The Beach Club a few minutes from the site entrance. 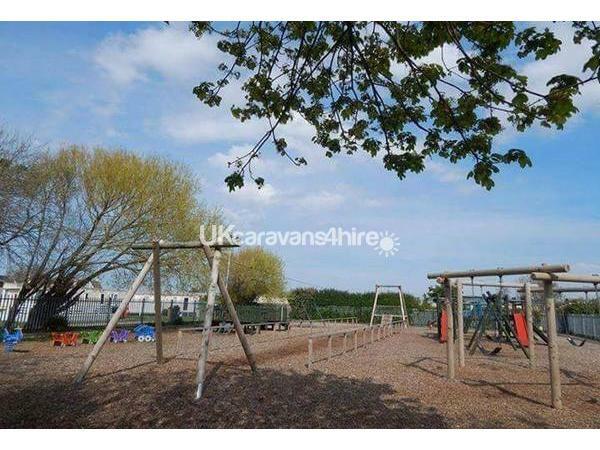 The Blue Flag beach is a few minute walk from our caravan via a path and a few minutes further the Nova Centre which includes a swimming pool, children's play centre and restaurants. There is also our sister site robin hood, it has amusements, swimming pool, two clubs one for the kids too, there is a free shuttle bus from Lido to robin hood, passes are available to buy from reception a weekly Family Pass Low Season £35 and High Season £50. Prestatyn town a 5 minute drive, it has local shops and cafes and also Prestatyn Shopping Centre that includes Tesco, Boots, M&S, New Look, Next, Costa and many more the local Bus station and Train station are close by.